Creeping Marshwort (Apium repens) now established at Cutteslowe (photo 2018). Volunteers learning about practical management, here looking at the Creeping Marshwort at Cutteslowe., 2018. Water quality testing by FHT, here for nitrate and phosphate levels at Chilswell Valley, 2018. Oxford City Council’s Planning Review Committee met last night to reconsider the application to extend Seacourt park and ride. This had previously been approved by West Area Planning Committee but a review had been requested by concerned councillors. The review committee confirmed the previous decision. There is a report in the Oxford Mail. We believe this decision is a huge mistake and we are disturbed by aspects of the decision-making process. There is no lack of parking spaces here, nor overall. Should it ever be needed, better usage of existing parking could easily be achieved by live signage on the ring road. We have collected online data and visited the site over the very busy pre and post Christmas periods – the existing car park has never once been full. Opening of the new Westgate has not caused problems and many people clearly choose to drive into the city rather then use park and ride. The cost is huge, £4.1 million is already budgeted. And there are many other urgent calls on the public purse. People are homeless and sleeping on the streets just a mile away. The site floods from groundwater – an aspect that has received scant attention, despite our highlighting it repeatedly. Because of groundwater flooding there will be a net loss of floodplain if this development goes ahead. The site will also flood when the rivers flood. This will make it expensive to pump out, maintain and repair. The decision is undoubtedly contrary to national planning guidance (NPPF) which is there to protect the floodplain and Green Belt. A previous extremely similar application on the site was the subject of a Planning Enquiry in 1998 and refused by the Secretary of State in 1999. Since 2007 the guidance has been strengthened following the Pitt Report on the Oxford and nation-wide flooding in 2007. It is possible that the present application will be Called-in by the present Secretary of State for Communities and Local Government, Sajid Javid: we have requested, jointly with Layla Moran MP, that this should happen. If the application is Called-in a Public Enquiry will follow. 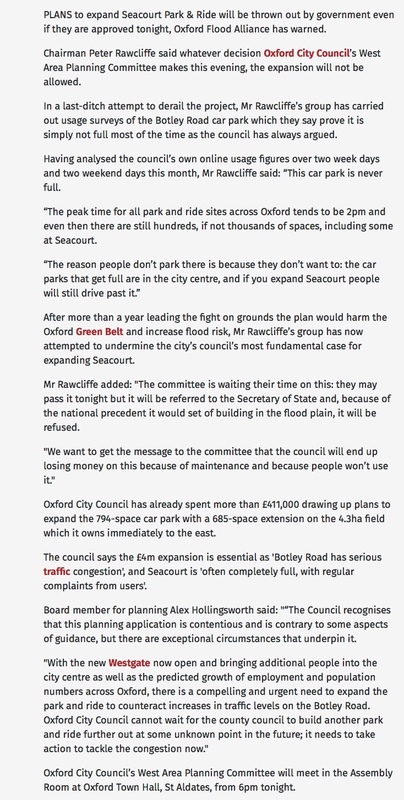 The reason for our request is that a decision to develop a car park in the floodplain sets a serious national precedent. Building in the floodplain is deplorable, except in the most exceptional cases – which this most certainly is not. If the extension does eventually go ahead it is not impossible that the Council will in time come to regret it – as construction costs rise, maintenance is expensive due to recurrent flooding (exacerbated by climate change) and occupancy is low. But that will be no comfort – much better it should never happen in the first place. Today there are Environment Agency Flood Alerts for our area. As we write, water from ditches to the west is starting to accumulate in a corner of King George’s Field, behind Duke and Earl Streets, as it does at the start of every flood. More rain is forecast tonight. And on the very same day we read of opposition to the Oxford Flood Alleviation Scheme in the Oxford Mail. The Scheme is designed to save many, many hundreds of homes and businesses from recurrent flooding, at enormous stress, disruption, and financial cost – to individuals, families, businesses, and the whole Oxford community. Climate change is widely expected to make things far worse in the future. We’ve been at this for ten years now and in our opinion (and that of many others) there is no viable alternative, “Green” or otherwise. If we don’t get the Oxford Flood Alleviation Scheme it’ll simply be a disaster for Oxford. 12 Oxford City Councillors have successfully asked for the application to be Called-in for consideration by the council’s Planning Review Committee. The next meeting of that committee is (provisionally) on 18 January 2018 so that seems the likely date – but subject to confirmation. Also in the Oxford Mail re city centre car park charges rising – NB this affects only Worcester St (104 spaces) and Gloucester Green (209). Oxpens (420) and Westgate (1002) are not affected. The Oxford Mail has reported already. We’ll have a great deal more to say about what went on, but for the tonight the article speaks for itself. This is far from over yet, this was only the first round, the fight continues unabated tomorrow. From today’s Oxford Mail online. An article in today’s online Oxford Mail – £400,000 has already been spent in consultancy fees and other expenses on this unnecessary plan. If it goes ahead the present budget is over £4 million, a lot of public money to no good purpose.